On November 22nd, I posted that I had made baked Alaska. 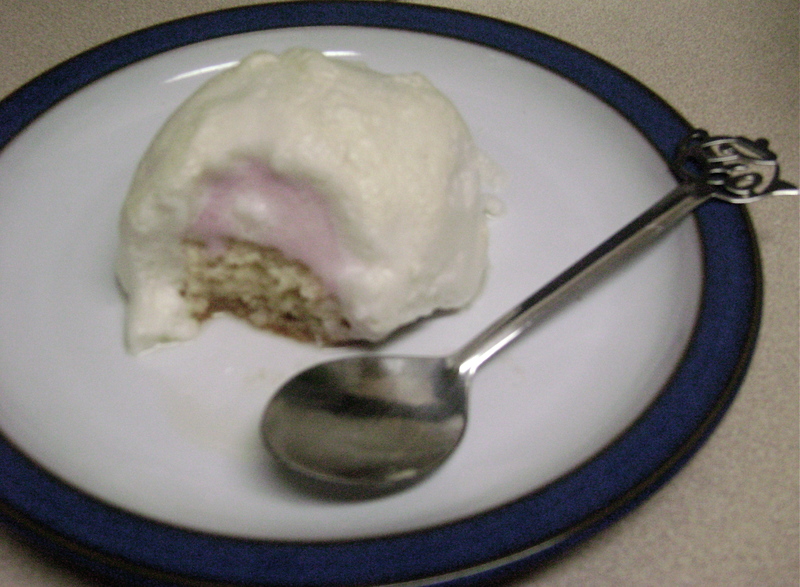 Not only was it the first time that I made baked Alaska (or, if you want to be fancy, glace au four; in most cases, any food – whether it is a main course, dessert, or other – with a French or other foreign language name is sure to impress, since gives off a kind of exotica), it was also the first time I had ever tried it! I came to make it, almost unprepared, when someone made an impromptu request. I used a gluten-free rice flour cake mix for the cake component and it was such fun. It was only one of the few times I’ve actually made a cake from a mix; usually I make cake from scratch. Cake mixes are generally straightforward, but twice I almost messed up, with the eggs and the water. Initially, I cracked enough eggs for 200 ml (the instructions actually said 300 ml, and I fixed my measurement) and as for the water, I almost forgot to add it – only remembering just as I was about to pop the cake in the oven. (For the cake mix ingredients, see my entry on Flickr.) My near-scrapes merely resulted from not paying attention; thankfully at least, it wasn’t a scenario from Anne of Green Gables when the titular character accidentally, unknowingly, flavoured a cake with anodyne liniment. While I made mine with a cake mix, you can use any sponge cake recipe, keeping in mind that it must be flexible for molding – I don’t like recipes that call for special mixes, i.e. cake or flour mixes (unless a recipe for the mix is included), as it can be such a hassle if trying to convert the recipe. There are two ways to make this cake: 1) a cake mold in which the ice cream is encased with strips of cake and the cake is then covered with meringue, or 2) a scoop of ice cream is simply put on top of the cake and covered in meringue. While I’d wanted to do the first method, I had to go with the second option when the cake I made from the cake mix turned out not to be so spongy or flexible. As serving traditional baked Alaska (individually served slices) can become a little problematic, in the sense that it must be served immediately and leftovers usually don’t keep very well (ice cream melting, meringue weeping), in an inspired moment I decided to make mini baked Alaska. Making minis took care of the meringue problem: each person would get their own little baked Alaska and the minis aren’t topped with meringue until actually read to serve, as the cake is only very briefly baked in the oven just to brown the meringue. So you would have smaller versions of the dessert and depending on the number of your company – guests, family, or friends – you wouldn’t need to assemble and serve them all at once immediately, as you have to when making one baked Alaska that is sliced and served. Everything has to be perfectly controlled, so it’s best that all your ingredients are measured in advance and when it comes time to assemble, have everything laid out so that there’s minimal stress and hassle for you as the baker. Relatively speaking, for my first attempt, it was easy. My only challenge was with the ice cream melting, when I would put it in the oven to brown the meringue. The first few attempts had it just on the verge of melting when I took it out of the oven, or already starting. (You know what I need? Willy Wonka’s ice cream that never melts.) It took me a number of tries to master it – which, mainly, was fiddling with the oven temperatures. Though an oven temperature of 400-425ºF (I use an electric) may be okay for a regular baked Alaska, it’s too hot for little ones. After some tinkering, I figured 375ºF would be okay. 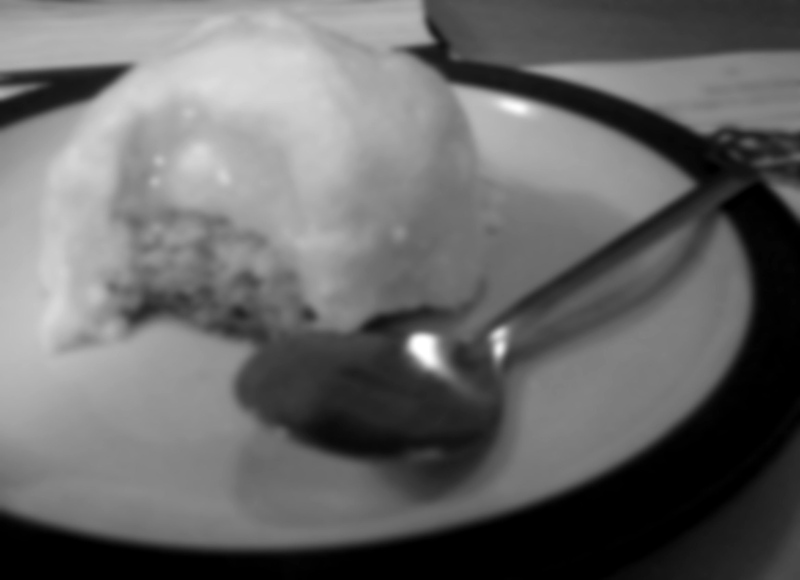 I whipped the meringue, thoroughly covered the cake and ice cream with it and put it in the oven for 3-5 minutes. It worked. I took them out, and while the ice cream wasn’t solid solid, it was a lot better than previous attempts. Upon my word, the ice cream was still cold! It was incredible to be eating something that had come from the oven, with a cold interior – as I ate it, I kept on exclaiming, “It’s science!” as if I had stumbled upon some great discovery. In this attempt I also learned that next to figuring out the proper oven temperature, the trick to preventing the ice cream from melting is to liberally cover it with meringue, especially the ice cream area. If it seems a little thin, top it with some more. 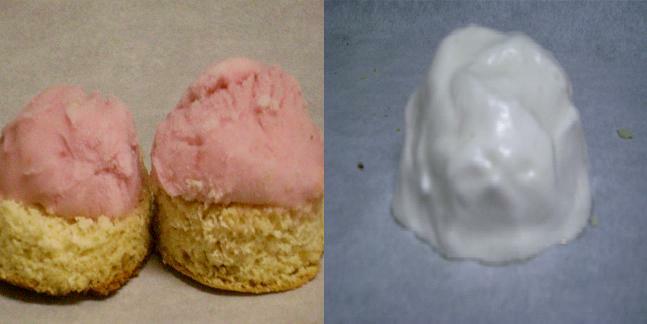 It’s going to look like a mound, bigger than the petit four that isn’t covered with meringue. You may have to tinker a bit with your own oven temperature, but there’s no going wrong about the meringue. 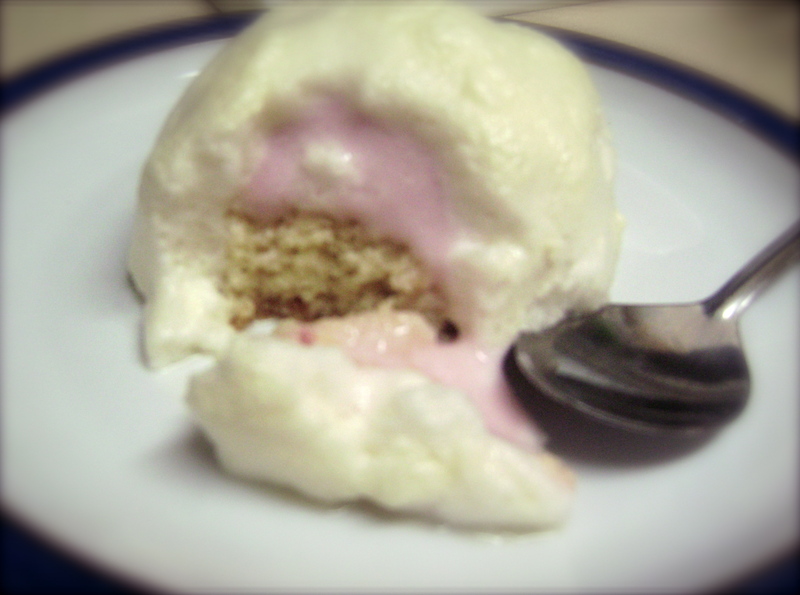 In sum, baked Alaska at its most basic is simply just sponge cake, ice cream, and meringue. When one knows how to make those components properly, one doesn’t really need a recipe per se; you only need to know how to put it together. Makes 1 dozen petit fours, or 24 petit fours (cut in half), depending on the size of cookie cutter used. Make sure that the cake is completely cool. Cut cake into circles using a cookie cutter. You may choose to cut them in half, crosswise, depending on height (it shouldn’t be unwieldy when eaten). Set aside. Assembly: when ready to serve, preheat oven to 375ºF. Whip egg whites with a pinch of salt until stiff. While still mixing, slowly pour in honey. Add vanilla. Remove cakes from freezer and cover with meringue – if you can get peaks, great, if you don’t make peaks that’s fine as well. It’ll still look smashing. Place the cakes on a pie plate or baking pan; if glass, you may or may not line it with parchment paper, your choice (though parchment paper may be easier as the meringue sometimes sticks). Bake until meringue is golden brown, about 3 to 5 minutes. Remove from the oven and serve immediately. Enjoy! I am officially impressed! I don’t know if I would have the confidence to try making that! The pictures are lovely and make me HUNGRY HUNGRY HUNGRY. Do you do takeout if I call ahead? 🙂 Keep the hard work and good treats coming. For some reason my post didn’t show but I wanted to try again because I applaud the fact that you made this! I have heard and seen it before but found the idea daunting and this is the first time I think I would actually like to try it, although if successful, I would be hard to live with! 🙂 Only downside to reading this, I am now hungry! Love your blog. Keep up the good work and Have a great Christmas!